Every person can benefit from mindfulness meditation, as all of us can use time during our day to reflect and be present. We often don��t do this enough and are fixated on what is to come, versus enjoying or acknowledging the moment. Those who are stressed, feel anxiety, are struggling to concentrate in work and life, or just need to ease their mind and body can benefit from daily practice of mindfulness meditation. Mindfulness meditation has many benefits beyond the above mentioned. Five minutes of daily practice can help focus one's mind and prepare for the challenges ahead. If you are interested in practicing mindfulness meditation, try the exercise below or go online for additional resources. There are many free resources available to learn mindfulness meditation. Berkeley University. ��Mindfulness | Definition.�� Greater Good, greatergood.berkeley.edu/mindfulness/definition. Accessed 24 Aug. 2017. Michael Forrester. ��What Happens to Your Brain When You Practice Mindfulness.�� Waking Times, 26 July 2016, www.wakingtimes.com/2016/07/25/what-happens-to-your-brain-mindfulness/. Accessed 24 Aug. 2017. Ireland, Tom. ��What Does Mindfulness Meditation Do to Your Brain?�� Scientific American Blog Network, June 2014, blogs.scientificamerican.com/guest-blog/what-does-mindfulness-meditation-do-to-your-brain/. Accessed 24 Aug. 2017. Andy Fell. ��Mindfulness from meditation associated with lower stress hormone.�� UC Davis, 23 Jan. 2016, www.ucdavis.edu/news/mindfulness-meditation-associated-lower-stress-hormone. Accessed 15 Aug. 2017. 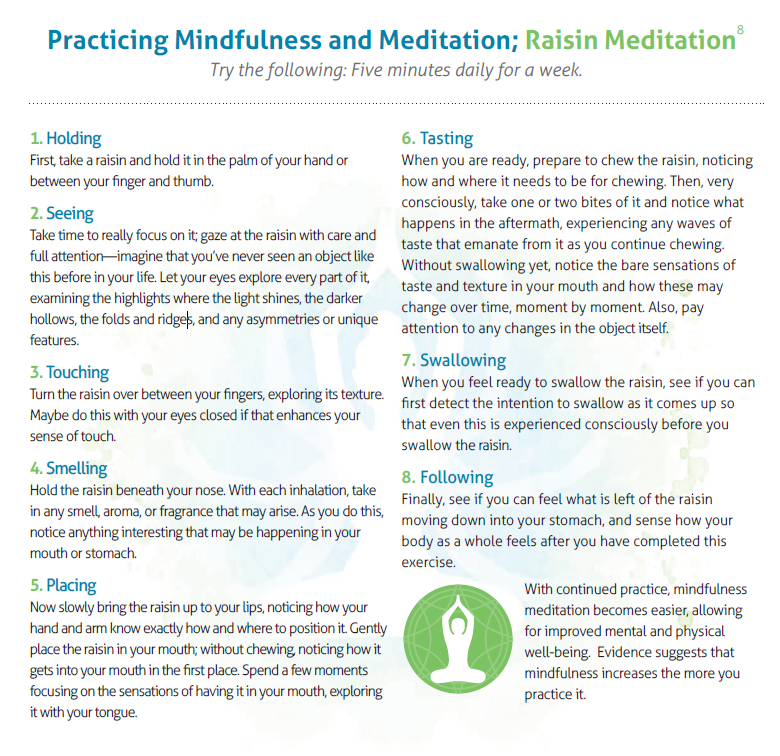 ��Eating One Raisin: A First Taste of Mindfulness.�� Extension Service, West Virginia University. Adapted from: Williams, M., Teasdale, J., Segal, Z., & Kabat-Zinn, J. (2007). The Mindful Way through Depression: Freeing Yourself from Chronic Unhappiness. New York: Guilford Press.